For years there has been interest in the possibility of building a reliable odor reproduction system (AOS), with its vast spectrum of applications: from e-commerce, games and video, via the food and cosmetics industry, to medical diagnosis. Such a system would enable an output device — the whiffer — to release an imitation of an odor read in by an input device — the sniffer — upon command. To realize this scheme one must carry out deep and complex research that combines computer science and mathematics with chemistry and biochemistry, and brain science with psychophysical work and human physiological experimentation. In the process, we expect a deep understanding of this least understood of our senses to emerge. In this talk I will discuss the question (not unlike Turing’s 1950 question about artificial intelligence) of how to test the validity of a candidate ORS, in face of the impossibility of naming odors in general, and despite the fact that such systems still being far from being viable. The importance and nontrivial nature of the question are discussed, and a novel testing method is proposed, which involves ideas from imitation and recognition, taking advantage of the availability of near-perfect reproduction methods for sight and sound. Prof. David Harel is the Vice President of the Israel Academy of Sciences and Humanities, and has been at the Weizmann Institute of Science since 1980. He was Department Head from 1989 to 1995, and was Dean of the Faculty of Mathematics and Computer Science between 1998 and 2004. He was a co-founder of I-Logix, Inc., which is now part of IBM. He received his PhD from MIT in 1978, and has spent time at IBM Yorktown Heights, and sabbaticals at Carnegie-Mellon, Cornell, and the University of Edinburgh. 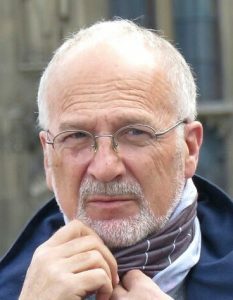 In the past he worked mainly in theoretical computer science (logic, computability, automata, database theory), and he now works mainly on software and systems engineering, on modeling biological systems and on the synthesis and communication of smell. He is the inventor of Statecharts and co-inventor of Live Sequence Charts (LSCs), and co-designed Statemate, Rhapsody, the Play-Engine and PlayGo. Among his books are “Algorithmics: The Spirit of Computing” and “Computers Ltd.: What They Really Can’t Do”. His awards include the ACM Karlstrom Outstanding Educator Award (1992), the Israel Prize (2004), the ACM Software System Award (2007), the Emet Prize (2010), and five honorary degrees. He is a Fellow of ACM, IEEE and AAAS, a member of the Academia Europaea and the Israel Academy of Sciences, and a foreign member of the US National Academy of Engineering and the American Academy of Arts and Sciences.